Click on the pic for larger view. 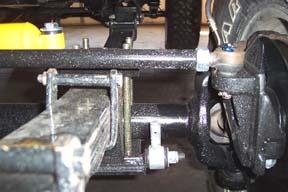 This shot shows our exclusive steering shock mount and the upper drag link to the pitman arm. Check the nice flat angle at 6" of lift! Click on the pic for larger view. This shot shows the driver's side mount. Catch a glimpse of the spring mount too. Sorry for the dirt, we like to play... not wash.
Over-The-Top&REG; (Trademark Pending) steering system replaces the factory Jeep components and places everything ON TOP OF the springs. No other kit on the planet does this. Some systems move the drag link to a higher spot, but we raise the drag link AND the tie rod for a true knuckle over high steer system. Angles are so dramatically reduced that it ELIMINATES bumpsteer. Moving everything to the top helps protect your entire steering system from trail damage. Again, other kits... only move the drag link up. The Rocky Road OTT Steering kit is designed for use with Dana 30 front axles on Jeeps with 4" or more lift. 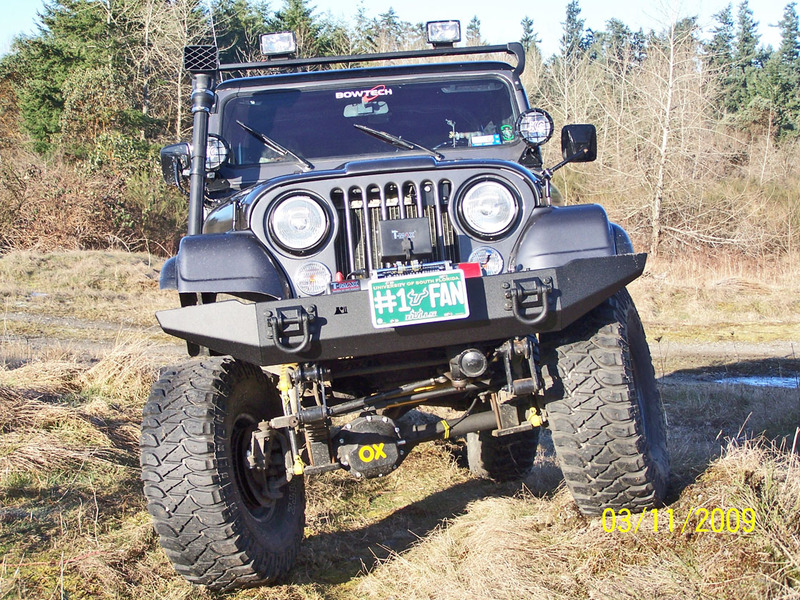 CPT, Eddie Grey shows us his clean looking CJ with Rocky Road Bolton SOA kit and OTT High Steering kit. Notice how high the steering sits out of harms way, also flattens the angles for better handling. We thank Captain Gray for his military service and for having such a sweet looking Jeep! Click for larger view. The strength and performance of this system blows all other steering kits out of the water. The arms are carved from solid machine stock steel with horizontal grain. This makes them incredibly strong! Our new steering system incorporates caliper mounting so that the arm is held solidly on two planes and is incredibly strong. Each knuckle hosts a 5 point mounting system for super strength and safety. 1972-75 kits also come with additional bracing and brackets for the old style knuckle system. All tubing is .25" DOM and guaranteed never to bend. Kit comes powdercoated black for an excellent look and durable finish. Perhaps best of all, this is kit 50-state legal. We use tapered ball joints at each mounting point. Other kits use standard rod ends. These are illegal to use in a steering system on public roads AND allow play in the system so the steering feel loose. Our kits uses fitted tie rod ends for a precision feel and handling. We also use LH and RH threads on our tie rod so that alignment can easily be peformed. All tie rod ends are standard off-the-shelf parts for easy replacement if they ever wear out. No custom pieces to track down. We can just give you the universal part number for easy replacement. The OTT steering system is the only kit to offer full legality on public roads. Drop pitman arms are NOT necessary for this kit with stock or lifted springs. Our engineering takes care of all this. Want to run a steering shock/stablizer? No problem. As pictured below, our kit accepts the our special length steering shock kit adapted from Old Man Emu... the finest heavy duty steering shock on the planet for this size Jeep. Price? HA! The other guys fear our pricing! Compare systems and you'll wonder why their setups cost more when you're actually getting much less value. The Rocky Road OTT system offers the ultimate in strength, engineering, and unbeatable pricing! High steer kit pictured below, with the optional steering shock kit. Drag link over the top of the springs. Better price, value, and engineering -Theirs is over $700! The above chart is 100% accurate. You might wonder what the heck those other systems include at their higher price with so many red strikes against them. Well... it has us wondering too. The OTT Steering system is clearly the best choice for your CJ. There is no over-steer or under-steer with this system, just perfect handling. It is 50-state legal. Stronger than all get-out, and our price puts other kits to shame. We don't want to make our competitors cry.... but they just might. Only available for the factory Dana 30 front axle. For those of you who have drop pitman arms and wish to run our High Steer system, we do sell stock replacement pitman arms so you can remove your drop pitman. Please note: If you choose to run a steering shock, you MUST purchase the OME steering shock kit.No other steering shock can be used without risk of damage to your new steering system as this item is specially designed with a longer than stroke. Anything shorter will bind and cause breakage. OTT steering kits are designed for use with all steering systems... 1972 and newer. If you have a 1971 or older model CJ without a Bell Crank steering system, please contact us to discuss fit before ordering. Wide-track axle is about 46" from rod end to rod end. 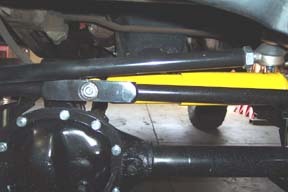 Narrow-track axle is about 43" from rod end to rod end. *Some 1986 models may require additional trimming for proper steering knuckle fitment. Or call our tech line at 888-801-7271.